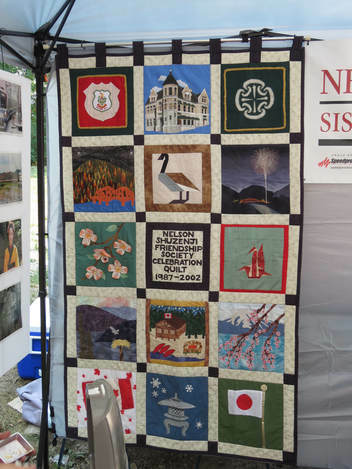 ​In 2002 a group of Nelson quilters decided to celebrate the 15th year of the sister city relationship between Shuzenji (now part of Izu-shi), Japan and Nelson Canada, by making a celebratory quilt. The quilt consists of 15 panels depicting the crests of Shuzenji and Nelson, 12 images from the two cities, including Mt. Fuji and cherry blossoms (visible from Shuzenji) and the Nelson ‘big orange bridge’ over the Kootenay River, and the title. ​The quilters were led by Lois Brulotte who sewed many panels including the two crests and the image of cherry blossoms in 3D. The other quilters were Brenda Craft, Natsumi Kasai, Cynthia Marshall, Jill Walgren, Naomi Walgren and Jennifer Zibin. In 2002 the beautiful quilt was presented to the Mayor of Shuzenji, Nobuhiko Oshiro, and was taken back to Japan. For most of the last 15 years it hung in the Izu-shi City Hall. When the delegation from Izu-shi visited Nelson August 2017, they surprised everyone, especially the quilters, by bringing the quilt. It was displayed at the Izu-shi booth at the Cottonwood Falls Saturday market in Nelson on August 5th, at the Obon picnic the same day, and at the 30th anniversary event at Cottonwood Falls Friendship Garden on August 7th . ​At the Saturday market Jennifer Zibin pointed out her contribution to Hiroyoshi Suzuki, President of the Izu Association for Friendship Relations. 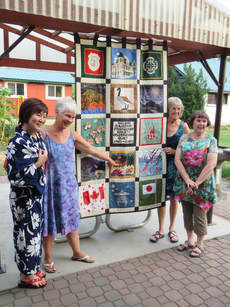 ​​The quilt was shown to Atsumi Kuroshi by Cynthia Marshall, Lois Brulotte and Brenda Craft (l. to r.) at the Obon picnic in Lakeside Park, Nelson. 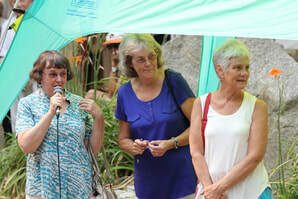 ​Brenda, Lois and Cynthia (l. to r.) also gave brief speeches at the 30th anniversary event. Atsumi told us that the plan is to display the quilt in Niji no Sato in Izu-shi where there is a replica of the old Nelson city hall in the Nelson ‘village’. 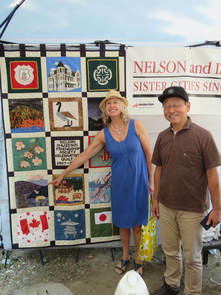 Thank you to all the quilters for making a lovely quilt and congratulations on helping to maintain the long connection between Izu-shi and Nelson. Malcolm Fitz-Earle, with thanks to Margot Zimmer, Atsumi Kuroshi and Rachel Greenaway.